A snow-clad peak positioned in Pir Panjal Range in Himachal, Mount Ladakhi offers a trekking route that simply spellbinds the adventure lovers in no time. 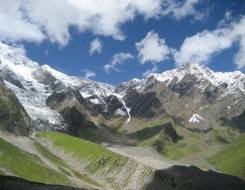 The trek begins from Manali and passes through the widely known Solang Valley. Traveler has to go to Manali from Delhi in an AC Volvo Bus and from Manali, the amazing experience starts. The excursion offers the adventurers a tranquil and arresting landscape perfect for the photography freaks as well. The ambiance boasts verdant grasslands, glaciers and snow covered mountain peaks. The trek passes through Bakarthach and Dhundi and enters Beas Kund Glacier, which is the originating point of Beas River. Bakarthach is an exquisite region offering mesmerizing panorama boasting imposing mountains. The trail also offers intriguing vistas of Pir Panjal and Dhauladhar Ranges. This 12 nights and 13 days itinerary is a matchless tour for all the adventure buffs and nature lovers who want to unfold the nature's extravaganza. All the days are filled with exploring the beautiful facets of nature in a way so heartwarming. The tour offers the tourists to drench in nature's opulence and quench their adrenaline rush as well. It is a trip that makes the tourists want to come back again and again. On arrival at New Delhi airport, meet our representative and thereafter get transported to your pre-booked hotel for an overnight stay. In the morning after breakfast, we will leave to explore some of the major locations in New Delhi. Later in the evening, we will drive to Manali by an AC Volvo bus coach around 6.30pm. Enjoy an overnight bus journey. On arrival in Manali in the morning, get transferred to the hotel to rest for some time. In the evening, take an acclimatization walk around the area and also check the equipment. An overnight stay at the Hotel. After breakfast in the morning, we will drive 13 km to Solang Nallah. Solang is hub for adventure activities like paragliding, skiing, camping, etc. and from here trek 6 km to Dhundi. On reaching Dhundi, enjoy evening tea and refreshment at the set out camp at Dhundi. An overnight stay in the tent. Today, we will leave to gradually ascending from the valley and continues to the scenic place at Bakarthach. Enjoy 30 minutes break at Bakarthach. Thereafter, trek over moraine to the small lake at Beas Kund, the birth place of the river Beas. Beaskund is the base of the all the surrounding peaks like Shetidhar (5289m), Ladakhi (5536m), Friendship (5340m) Manali (5725m) Hanuman Tibba (5940m). Enjoy an overnight stay in tents. In the morning after breakfast, we will move to Beaskund glacier. Practice ascending and descending with technique on snow and also practice rescue technique like Z-pulley, C-pulley, etc. Later return back at the camp for lunch. Enjoy a night stay in tents. Today, we will steep ascending to Camp- 1 with packed lunch. Enjoy lunch at the established camp. Later in the evening after tea, go for acclimatization walk. Return back to the camp for early dinner and an overnight stay. The day is fix for some adventure and fun. For this, we will proceed to Shetidhar peak which is only 30 minutes climbing from here and Ladakhi is around 2 hrs climbingfrom col. And after col, we fix the rope and will climb through that fixed rope. We have to do some rock climbing from here and witness very panoramic view of Dhauladhar and Pirpanjal range with Indrasan peak(6160mts) and Deotibba Peak (6001mts). After summit the peak, we will return back to camp-1 for enjoy an overnight stay in tents. After breakfast in the morning, we will move back to Beaskund. Thereafter, enjoy free lunch in the camp. In the evening, be a part of celebration with bonfire and later, enjoy a night stay in tents. In the morning after breakfast, we will trek to Solang Valley. From here, we will drive to Manali. Evening is free for shopping at Manali. Enjoy a night stay at the hotel in Manali. Today, wake late in the morning, Later, explore all the surroundings in the morning and then drive to New Delhi in the evening by AC Volvo bus. Take pleasure of an overnight Volvo journey. On arrival in New Delhi in the morning, our representative will transfer you to your already booked hotel. Later, transfer to the international airport in the evening to catch the flight for onward destination. End of tour and services.